By Stefanie Woodard, D.O., Susann E. Schetter, D.O. Breast asymmetry can prove clinically challenging. Terminology for asymmetric findings in the breast has been controversial and has undergone alteration as recent as 2003, with the fourth edition update of ACR BIRADS lexicon, changing “asymmetric breast tissue” to “global asymmetry.” Global asymmetry is increased fibro-glandular tissue in at least one breast quadrant. This appearance can cause concern and result in unnecessary biopsy or workup. 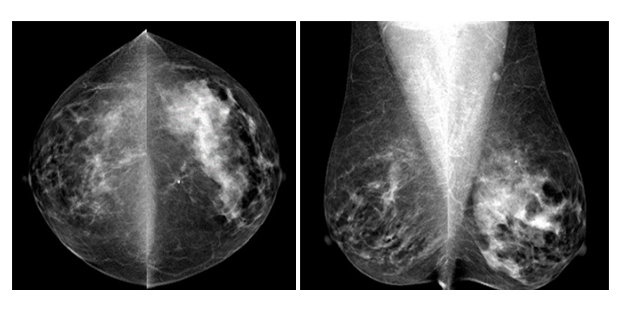 The bilateral MLO and CC views demonstrate global asymmetry in the left breast. Appropriate to the definition, this patient did not have a focal mass, architectural distortion, associated calcifications, or palpable abnormality. This setting reinforces benignity and is found in up to 3% of women. Global asymmetry is usually a normal variant. Other etiologies include hormonal influences, breast reduction surgery, pseudo-angiomatous stromal hyperplasia (PASH), and surgical excision of developing breast tissue in prepubescent girls. It is necessary to resolve focal asymmetries with additional mammographic imaging and occasionally ultrasound. Masses will show convex margins on diagnostic imaging, while global asymmetry needs no further work-up if there is documented stability or lack of concerning features, as in the patient above. Woodard S, Schetter SE. At the Viewbox: Global Asymmetry. J Am Osteopath Coll Radiol. 2014;3(1):26. Stefanie Woodard, D.O., Susann E. Schetter, D.O. Dr. Woodard and Dr. Schetter work with the Department of Radiology, Penn State Milton S. Hershey Medical Center, Hershey, PA.